It was very tempting to find the best Cardinal red goatee pic of the 2nd Spiezio to wear a #26 jersey but much like his dad Ed, Scott’s tenure in St. Louis was largely unforgettable. The same could be said for both Marrero and Pena, but they were involved in vastly different trades that impacted the future of the franchise. Andy Van Slyke will be mentioned later in this countdown and still ranks as one of my favorites while Adam Wainwright will someday take his rightful place with the other legendary hurlers to don the Birds on the Bat. Out of everyone to wear this number, however, there was one player who not only surprised me during his tenure under the Arch but would be welcomed back with open arms. It seems like only yesterday Lohse was the poster child for the crusade to stop penalizing those tied to compensation. Whether or not that (and the DH) gets changed, a nice coincidence should benefit both the Cards and Lohse in the near future. It appears the spot on both ends of the rotation will go to veterans, and Wainwright is signed thru at least 2018. While it may be a very small list, Lohse has to be the best pitcher to have signed not one, but two March free agent contracts. He turned that initial late addition deal into a four year pact with St. Louis that had mixed results overall. Most fans had to believe his early bad luck was going to doom the Cardinals after all, but the exact opposite happened over the 2011 and 2012 campaigns. Once Wainwright was lost for the season, Lohse became the glue that held everything together in my opinion. Do the Cards win the World Series without him? Lohse failed to win a game in October but carried the staff at times leading up to the postseason. Remember that whole 10.5 games back thing in September, well it was Lohse who shut down the Brewers and began the fight back into the race. As impressive as that season was, however, it simply can not compare to his last one. 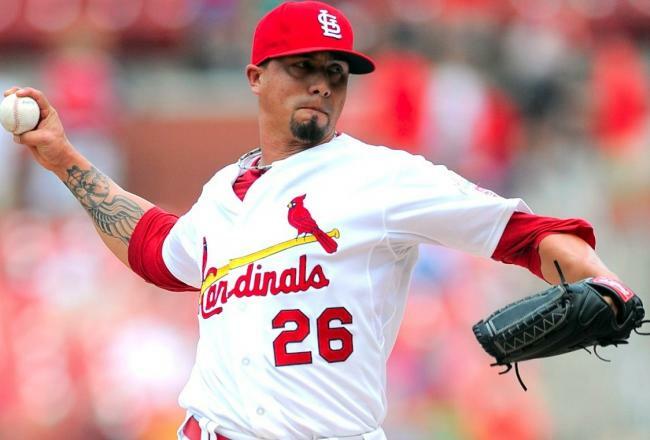 Anchoring the St. Louis rotation, Lohse put up video game numbers and capped off the year with a win for the ages against Atlanta in the Wild Card game. Would a reunion with Lohse make sense for both sides? A lot can happen over a summer, but I could happily see the righty comparing tattoos with Yadi in the dugout. Of course, I doubt the skipper would be open to swapping into a third different number so maybe a return to 28 as I hear it needs a new owner!